Mark Badgley and James Mischka looked to Buenos Aires in the ’50s for their fall 2016 bridal collection. Mixing classic styles with Hollywood glamour, Badgley Mischka has brides everywhere looking modern and sophisticated for their big days. Their inspiration seemed to continue the story of the woman they portrayed in the Badgley Mischka spring/summer 2016 ready-to-wear collection. With their RTW collection designed with aspects of the ’50s retro vibe, with a flair of timeless elegance, it seems the Badgley Mischka muse has entered the next stage of her life. For the spring/summer months, she was living her high society life, with the perfect clothes to match, and has now found a suitable man to marry. 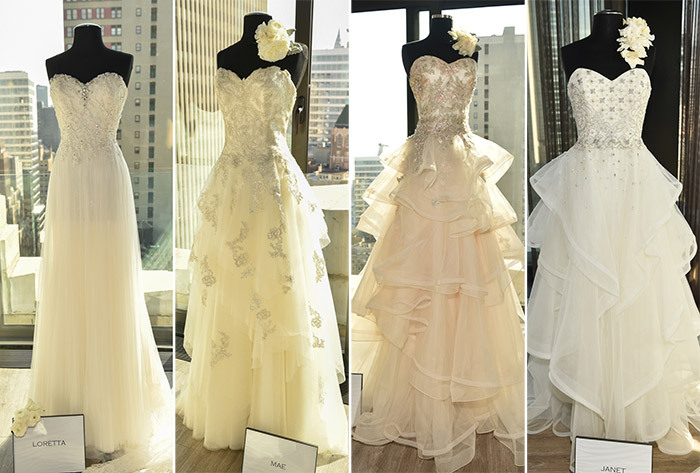 So now, she needs to find her wedding dress, and tries on all of these dresses to find the perfect one. Each dress has its own attributes that would make it perfect for this woman to wear, as the small details make it cohesive with the overall characteristics of the woman. Despite the extravagance of some of the designs, there is a breath of lightness flowing through the Badgley Mischka fall 2016 bridal collection, and there is no doubt the wearer will simply glide down the aisle. “Even when the dresses have volume, they’re light as a feather,’ said Badgley in an interview with WWD. Most of the designs were made from tulle, silk chiffon, georgette, lace, and mikado, so the designs are sleek, gorgeous, and also ensure the bride’s comfort. There was a definite leaning toward gowns with a sweetheart neckline. Since each dress is unique, the repetition isn’t redundant, and the different ways in which it is used creates a high level of diversity in the collection, despite the streamlined neck. The looks ranged from simple and clean to regal and elegant, so many women will be able to find their perfect look in this collection. The wide variety of shapes and silhouettes make it difficult to find any one gown as a standout piece. Each piece is beautiful in its own way, because each was made with a new woman in mind. 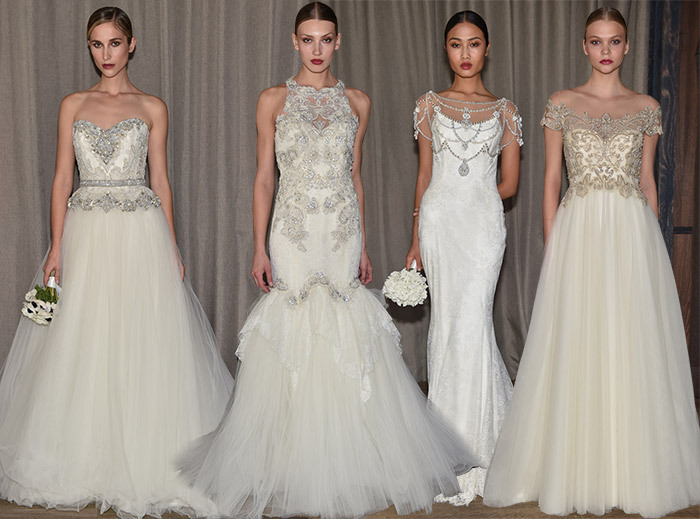 With the diverse silhouettes, it is clear women of many body types can find their perfect look in the Badgley Mischka fall 2016 bridal line. From classic ballgowns to slim-fitted dresses, Badgley Mischka has created a collection for women of any stature. Even with the most simply styled silhouettes, the brand hasn’t given up their glitzy romanticism. The use of intricate sequins and beading gave a sometimes subtle and sometimes glaring nod to the ritzy lifestyle of the Badgley Mischka client. As a woman seeking her own bridal gown, wearing any dress from Badgley Mischka’s fall 2016 bridal line would be a dream come true.